The article deals with the problem of automated forecasting of situations development based on analysis of heterogeneous data streams. Existing approaches to solving this problem are analyzed and their advantages and disadvantages are determined. The authors propose a novel approach to forecasting of situations development based on event detection in data streams. 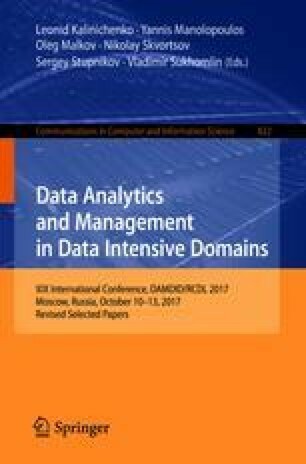 The article analyzes various models of events and situations and event detection methods that are used in the processing of heterogeneous data. A method for generating possible scenarios of situations development is described. The method generates scenarios using the principle of historical analogy, taking into account the dynamics of the current situation’s development. The probability of the generated scenarios’ implementation is estimated via logistic regression. The generated set of scenarios is analyzed using Analytic Hierarchy Process to identify the optimistic and the pessimistic scenario. The authors describe a way to supplement scenarios with recommendations for decision makers. The results of experimental evaluation of the quality of the proposed approach are presented.